A chemist is a scientist trained in the study of chemistry. Chemists study the composition of matter and its properties. Chemists carefully describe the properties they study in terms of quantities, with detail on the level of molecules and their component atoms. Chemists carefully measure substance proportions, reaction rates, and other chemical properties. Chemists use this knowledge to learn the composition, and properties of unfamiliar substances, as well as to reproduce and synthesize large quantities of useful naturally occurring substances and create new artificial substances and useful processes. 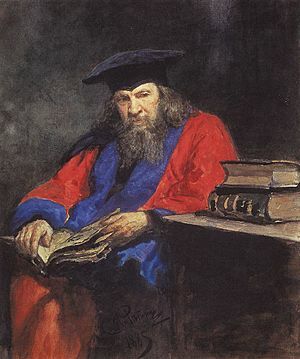 The roots of chemistry can be traced to the phenomenon of burning. Fire was a mystical force that transformed one substance into another and thus was of primary interest to mankind. It was fire that led to the discovery of iron and glasses. After gold was discovered and became a precious metal, many people were interested to find a method that could convert other substances into gold. This led to the protoscience called alchemy. 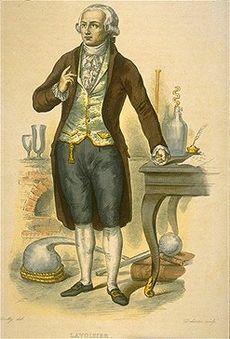 The word chemist is derived from the New Latin noun chimista, an abbreviation of alchimista (alchemist). 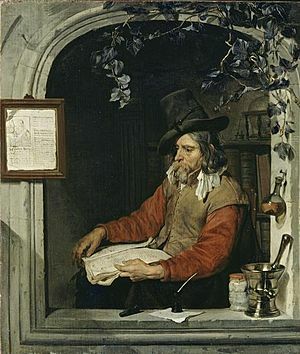 Alchemists discovered many chemical processes that led to the development of modern chemistry. 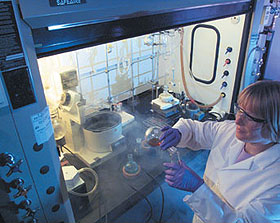 Jobs for chemists usually require at least a bachelor's degree, but many positions, especially those in research, require a Master of Science or a Doctor of Philosophy. Most undergraduate programs emphasize mathematics and physics as well as chemistry, partly because chemistry is also known as "the central science", thus chemists ought to have a well-rounded knowledge about science. 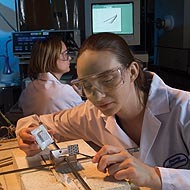 At the Master's level and higher, students tend to specialize in a particular field. Fields of specialization include biochemistry, nuclear chemistry, organic chemistry, inorganic chemistry, polymer chemistry, analytical chemistry, physical chemistry, theoretical chemistry, quantum chemistry, environmental chemistry, and thermochemistry. Postdoctoral experience may be required for certain positions. Chemist Facts for Kids. Kiddle Encyclopedia.